Monroe, Wash. – EvergreenHealth Monroe recently added new advanced multi-use beds in its critical care and medical surgical units, providing patients and staff with a host of innovative features to increase safety and convenience. The beds, manufactured by Linet, improve providers’ ability to facilitate quality care, while offering additional mobility and safety features designed to protect patients and improve their comfort level. These advanced features allow for easy control of mattress height and rotation, which can help decrease the risks and complications that come with caring for critically-ill patients, including those with pulmonary, cardiac or musculoskeletal problems. Through uniquely designed frame and surface technology, the Linet beds help prevent bedsores by reducing the friction that occurs when changing positions in bed, and minimizing pressure when patients lie down or sit for extended periods of time. The adjustable mattress platform also allows providers to easily reposition patients into a comfortable upright position to reduce abdominal pressure and allow for easier breathing. 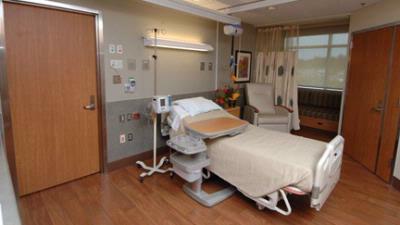 The design improves patient mobility and convenience when getting in and out of the bed. Using cane-like handles and height adjustment controls, patients can easily bring themselves to a convenient standing position. This feature also helps providers avoid injuries caused by linen changes or daily hygiene duties, thanks to the rotational assistance features that make common patient-focused nursing tasks easier and safer. This new bed technology increases functional efficiency for caregivers as well. Each bed features built-in scales that automatically calculate patient weight. And the bed’s overall design, which includes sealed columns, smooth plastic side rails, a flat mattress platform and a minimal number of small parts, reduces the time needed for cleaning and maintenance and lowering the risk for infection. In addition to the new beds, EvergreenHealth Monroe has also made other significant investments to improve patient care over the last year. The hospital introduced new wireless heart rate and vital signs monitoring units, computed tomography (CT) scan technology and equipment, pulmonary function testing tools, anesthesiology machines, orthopedic drills and saws, and stretchers and scopes – all of which were introduced and implemented throughout the year to offer patients in East Snohomish County access to the most advanced care and health care resources.